“Boy Erased” is a hard hitting drama about a young man forced to go to conversion therapy in order to “be saved”, but also to please his parents. It stars Lucas Hedge, Nicole Kidman, Russel Crowe and it’s written & directed by Joel Edgerton, who also plays the camp teacher in the movie. It’s one of the best movies I’ve seen lately and I can’t understand why it didn’t get into the awards circuit. First of all, the story truly is heartbreaking and disturbing. The things that happen in that place will make your skin crawl. There is a scene where one of the boys won’t show his true emotions to the group, so the organizers make a big deal out of it, even creating a fake funeral for him to symbolize his death to God. It’s disgusting, and the end of this specific story will make you cry. It’s maddening to see boys been treated this way and taught so many wrong principles (well, what most consider to be wrong): that they chose to be gay, that they can become straight again, and so on. I won’t go into more detail, I already said too much, but it made angry. Second of all, “Boy Erased” excels in acting, as well. Most of us are used to Nicole Kidman’s talent in conveying so many different types of characters, and she nails the Southern mama, with a horrible wig and all. I loved the intensity and wisdom she brought to the character. Russel Crowe was also great, and I was equally pleasantly surprised and horrified by Joe Alywn’s role. I also have to mention Troye Sivan, who is known as a singer (he did a great song for the soundtrack, too, called “Revelation”), but here plays one of the camp boys. A bit underused, but it was nice seeing him on screen. Same can be said for Flea (surprising appearance and part for the Red Hot Chilli Peppers bassist). The star of film, however, was Lucas Hedge. I think he is such an underrated actor, I wish he got more attention. With a great mix of vulnerability and power, he showed us a good child who wants to please his parents, but who is also strong enough to realize what is right and wrong, and to face it head on. His performance turned me into a fan and I can’t wait to see what he does next. 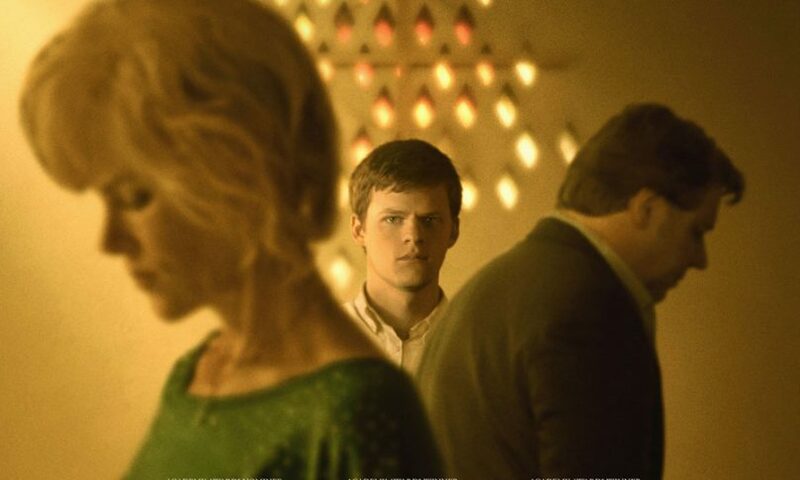 Filmmaking-wise, there is nothing spectacularly good or bad about “Boy Erased”. It looks fine and it serves the story. Joel Edgerton did a good job and I am curious to see what he does next, especially in the writing department. This story could have been made in an overly dramatic way, but it wasn’t, and I really appreciated that. Some might say that it’s not powerful enough, but it was for me. Sometimes, less is more. In conclusion, please go see “Boy Erased”. It’s sad and disturbing at times, but it’s a story that must be acknowledged. Especially for the LGBTQ community. Glad you enjoyed it! I’m looking forward to watching it in the next couple of days. The trailer always made me tear up though so I expect to cry! Yeah, I think I cried, too, I don’t remember. But I think you will like it. Can’t wait to see what you think of it! I liked bit didn’t love this, but the actors are incredible. I just wanted a bit more from it. I ended up liking The Miseducation of Cameron Post better, which shocked me because I don’t care for the lead actress in that at all. I know what you mean, it was pretty downsized in terms of emotions, not dramatic, and I think that’s why people didn’t get that emotionally invested in it. I keep hearing good things about the Cameron movie, I will try to get to it soon enough. Thanks for dropping by! I thought Kidman was great in this, but other than her performance the film didn’t really work for me. It’s an important story that needed to be told but the execution left much to be desired and I found the film dull and uncompelling. I’m glad it worked for you. A lot of people said that, I guess I’m in the minority here. I’m sorry to hear it didn’t work for you. Thanks for dropping by!